The world’s largest golf club, Mission Hills China, is opening up three of its courses to juniors from the around the world to play at no cost. The world’s largest golf club, Mission Hills China, is providing free golf to juniors under 16 from anywhere in the world to play three of its acclaimed courses. To mark its 20 th anniversary, Mission Hills – which has 12 courses at Shenzhen in Guangdong province and 10 on the southern island of Hainan – is opening up its Zhang Lian-Wei course at Shenzhen and Stepping Stone and Double Pin courses at Haikou (on Hainan) to nurture the development of junior golf as the sport prepares for its return to the Olympic Games in Rio de Janeiro in 2016. "For the past 20 years, Mission Hills has been committed to promoting and popularising golf in China, especially among junior golfers," the vice chairman of Mission Hills Group, Tenniel Chu, said in making the announcement. "By providing open access for juniors to our Zhang Lian-Wei, Stepping Stone and Double Pin Courses we hope more gifted Olympic golf talents can be nurtured." Mr Chu, who is secretary-general of the One Asia tour and the president of the Guangdong Golf Association, said it always had been Mission Hills’ vision to promote junior golf development and support the growth of the game internationally. Among its junior golf development initiatives have been staging the Asian Amateur Championship in 2009, a partnership with Nike Golf in 2011 to create the Mission Hills Nike Golf Junior Championship attended by Tiger Woods, and partnering with modern legends including Jack Nicklaus, Greg Norman, Sir Nick Faldo and Annika Sorenstam to host junior tournaments open to junior golfers worldwide. Already, one winner from these tournaments, China’s 14-year-old prodigy, Guan Tianlang, has qualified for the 2013 Masters and in April will become the youngest player ever to participate in the tournament. Dominic Wall, the Asia-Pacific director of golf’s governing body, the R&A, said: "This is a wonderful initiative for junior golf and Mission Hills must be congratulated for showing leadership in this area. This will lead to many more children taking up golf, which can only enhance development of golf in China." 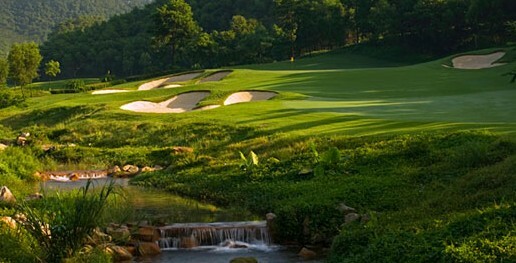 The Zhang Lian-wei course has been named the world’s leading par-3 course by US Golf Magazine. Stepping Stone and Double Pin are part of the world’s largest collection of lava golf courses on Hainan. Double Pin has two pins (flags) at each green, enabling players of all levels to hone their game in the complex’s visually stunning landscape.